Lack of privacy seems to be a common problem that comes with fame no matter the location. Sasaeng fans is a term used in Korea for obsessive fans. It can be translated in Chinese to 私生饭 sisheng fan. 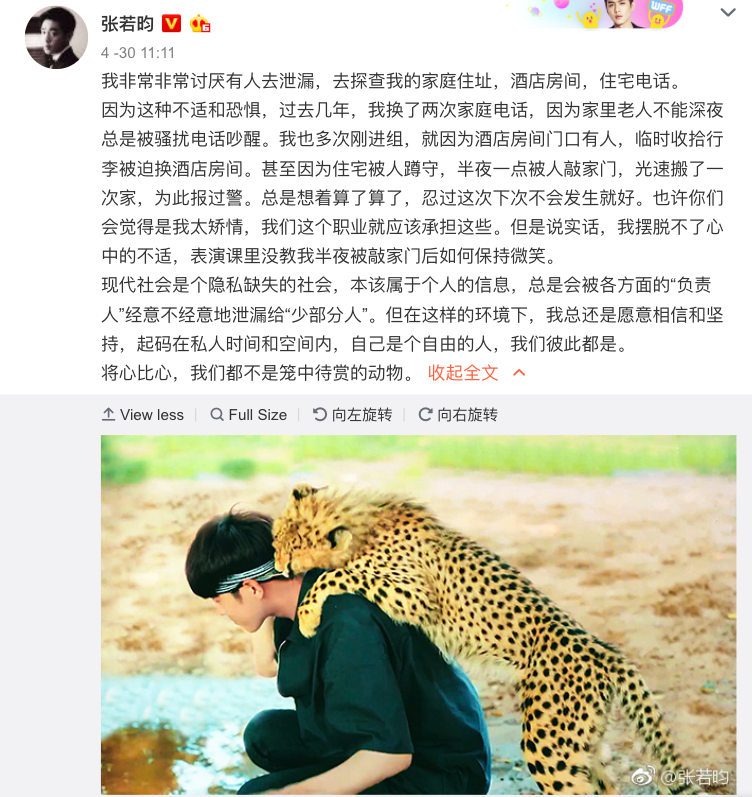 Zhang Ruoyun is the latest to speak up about such fans as he shares just how real a problem it can be, and it's definitely not just him that's affected. He writes, "I really really hate when people divulge information and check for my home address, hotel room and phone number. For fear of this, in the past couple years, I've changed my telephone number twice, because the elders at home are always woken up by the phone ringing in the middle of the night. There are many times when I just started filming, but because there are people waiting at the hotel room door, I'd pack up my stuff last minute and change rooms. It's even to the extent that people would sit outside my house. At 1am in the morning, someone would knock. I've had to move once over this and even alerted the police. I always think that it is what it is and that enduring is the answer. You might think I'm too unreasonable, this is the job that I chose after all. But to tell you the truth, I can't get over the uneasiness. Acting school didn't teach me how to greet the person knocking on my door in the middle of the night with a smile. Today's society is one that is lacking in privacy. Information that is private is always inadvertently leaked by other parties. In this environment, I still would rather believe and persist that my private time and space is still my own. We are not animals in a cage for display. It would be best if other parties who do have these information would comply with rules and not release them. I am glad you posted about it. I saw this the other day and I felt so bad for him. It is crazy that they don't even let him have his normal life. A lot of people close to celebrities divulge their private information. Then you see those celebrities that move into gated houses and it looks a bit ridiculous at first, but then you understand that they probably have no other choice. I do hope China has restraining order law that celebrities can use. I feel bad for him, especially if it's people that close to him that giving away his private information.